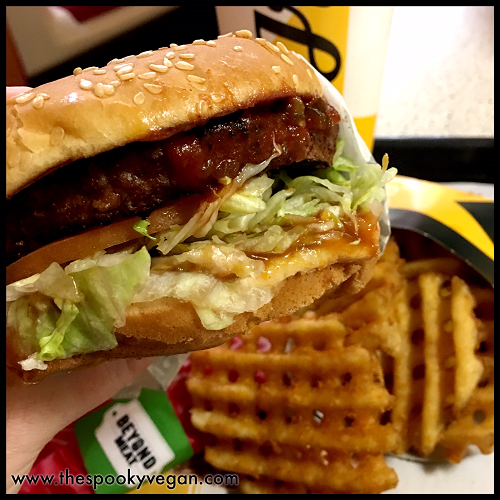 The Spooky Vegan: Vegan Beyond Famous Star Burger at Carl's Jr.
Vegan Beyond Famous Star Burger at Carl's Jr.
Whoa, vegan burger and fries at Carl's Jr.! This past weekend I finally got around to trying the new Beyond Famous Star burger at Carl's Jr. This plant-based burger featuring a Beyond Meat vegan patty debuted at over 1,000 Carl's Jr. locations at the beginning of January and seems to be a big hit with vegans and carnivores alike! I recently tried the vegan Beyond Avocado Tacos at Del Taco that are being tested in certain markets in SoCal, and I was stoked to try this new option at Carl's Jr., especially since it would be the first time in a long time that I would be able to order a vegan burger at a traditional fast food joint (though the vegetarian fast food restaurant Amy's up in the Bay Area will always have my heart!). 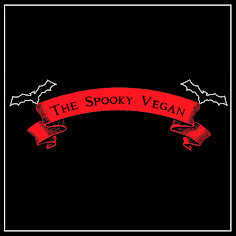 An important item to point out is that by default the burger is not vegan, as it contains dairy-based cheese and non-vegan mayonnaise, but you can easily request it with no cheese and no mayo to make it vegan. 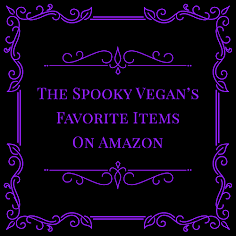 The bun and special sauce are vegan, and I also recommend to add BBQ sauce (also vegan) when ordering. The staff seemed really knowledgeable and excited about the new Beyond Burger, and were able to answer any questions I had. It was easy-peasy ordering the burger vegan! The price for the burger seems to vary by location, ranging from $6 and change to a little under $8 for just the burger. The combo (burger, fries, drink) is usually around $10. I got the combo, added crisscut fries (they are vegan), added BBQ sauce, and my total came out to under $13. 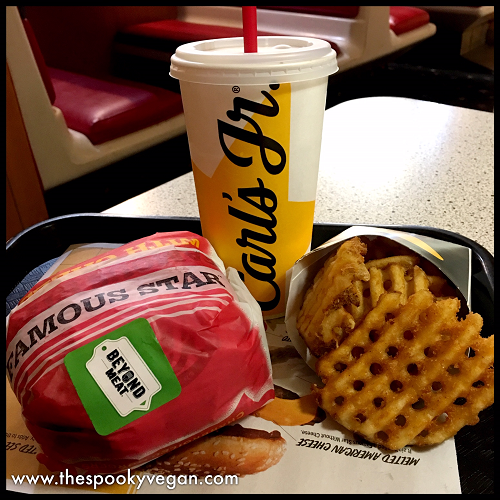 I actually sat down in Carl's Jr. to eat my meal, wondering in amazement when the last time I ever did that - it was at least 11 years ago, before I went vegan! I heard some other people ordering the Beyond Burger and it made my heart so happy. It's so great to begin seeing vegan options at frickin' fast food restaurants! Look at that gorgeous vegan Beyond Famous Star! I tore into my Beyond Burger, which is piled high with shredded lettuce, onions, tomatoes, slathered in special sauce and my addition of BBQ sauce. It was SO GOOD! There are other restaurants that have served the Beyond Burger but overcook it or mess up the preparation some way, but, dang, Carl's Jr. got it right! It was toothsome and juicy and just perfect. Pro-tip: shove some crisscut fries into your burger for the ultimate decadence! Now, I realize that this burger isn't exactly healthy, but it's all about access for people who normally may not try meat-free options. This way, more and more people will be exposed to vegan food, and if they try this at Carl's Jr. they may decide to pick up some vegan burgers or other vegan alternatives next time they are at the grocery store, which is progress! And of course, having this option at Carl's Jr. makes it easier for vegans, especially when traveling and not having many vegan options. I am over the moon that Carl's Jr. is offering a vegan Beyond Famous Star, and really hopes this sparks other fast food chains and restaurants to begin offering more and more vegan options. Have you tried the new Beyond Burger at Carl's Jr., and, if so, what did you think? Find out more about the Beyond Famous Star, including nutritional info, by visiting Carl's Jr.'s site! Great review, keep up the good work, I enjoy reading your reviews on food. We have Hardee's out here, and their vegetarian option is what my mom always called a "wish sandwich." It's two pieces of bread and wish you had something in the middle! I'm encouraged by restaurant chains like this getting better non-meat options--it's just that they always seem to test the market in SoCal and not somewhere like ATL! Oh well. I don't eat out much anyway.